The following are all family photos, but the identities of the people are unknown. If you think you can give me some clue, no matter how small, to any of these photos, please E-mail me. It would be very much appreciated. This page contains several images which may be slow to download. This first photo does have some clues in it. 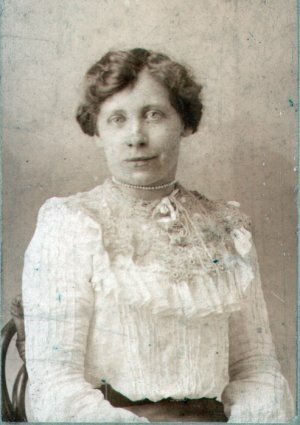 The original photo is stuck on a board, with the name F Preece, 24a Commercial Street, Hereford printed at the bottom - the name of the photographers presumably. The young man sitting on the stool has HMS Gladiator written on his cap. The HMS Gladiator sank in 1908, so the photograph must pre-date this. 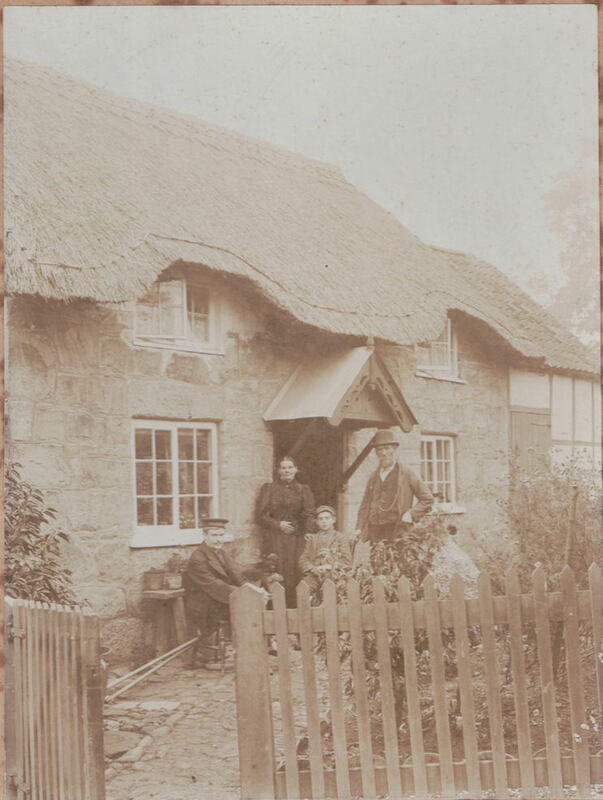 If anyone can give me any help either locating the cottage (somewhere in Herefordshire) or identifying the people, I would be very grateful. Any advice on how to go about finding crew lists for the HMS Gladiator could be very useful too. Solved!! At last finally solved who and where this one is. The cottage is at Stallenge, in Withington, Herefordshire. The older couple are James Corbett and his wife Fanny Green, with a boy who is probably their youngest son William Corbett. The sailor with the Gladiator cap I think is a neighbour's son - Arthur James Brookes. Arthur served on the Gladiator between October 1900 and March 1901, so the photo must date from around that time. I can't be absolutely sure the sailor is Arthur Brookes, but he's the only sailor I can find who served on the Gladiator and came from the Withington area. This second photo has no obvious clues. It comes from my Dad's side of the family, so was probably taken in Herefordshire. If anyone recognises any of these people, I would love to hear from them. If anyone could even suggest an approximate date for the photo, it would be a big help in narrowing down the options. Solved!! At last finally solved who and where this one is. 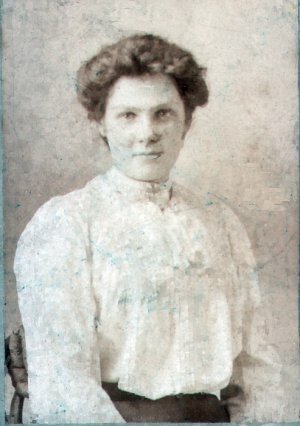 It is the Brookes family and was probably taken in Burghill, Herefordshire. 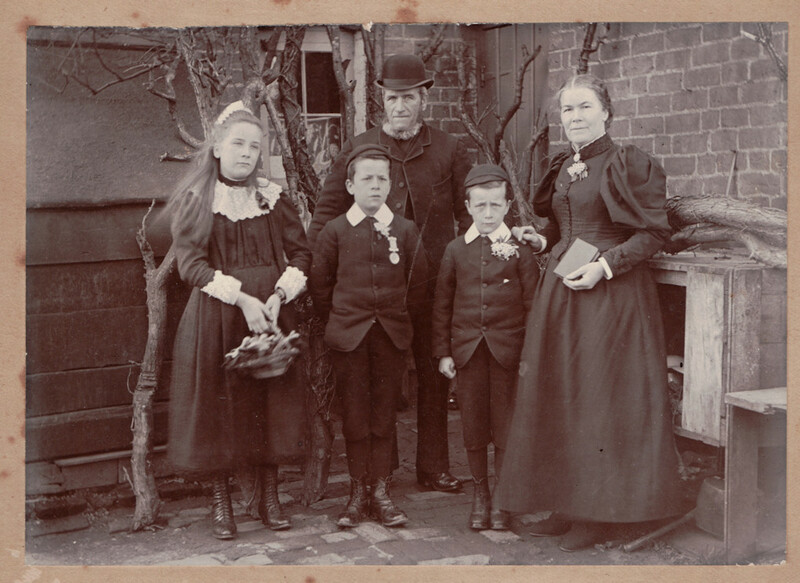 The older couple are Thomas Brookes and his wife Emma Chamberlain, with their youngest children Sarah, Albert & John Brookes. Albert has some kind of medal pinned on his lapel and is in the centre of the photo. He won a school scholarship around 1899, so I suspect this photo may have been taken around then to mark the occasion. This third photo I think comes from the Scottish side of the family. It may be Jane Johnstone (1844-1925) but no-one is sure. If anyone can help date the style of her clothing, or come up with any other suggestions, I would love to hear from them. This fourth photo must come from the Scottish side of the family, but I've no idea where James Johnstone fits into my family tree. Until recently, I didn't even know where the shop was. However, thanks to a very kind gentleman in Glasgow called Colin, I now know that James Johnstone's shop was at 1013 Cathcart Road, Glasgow. From Glasgow trade directories, I now know that the shop was there from at least 1924 to the 1950s, and possibly longer. 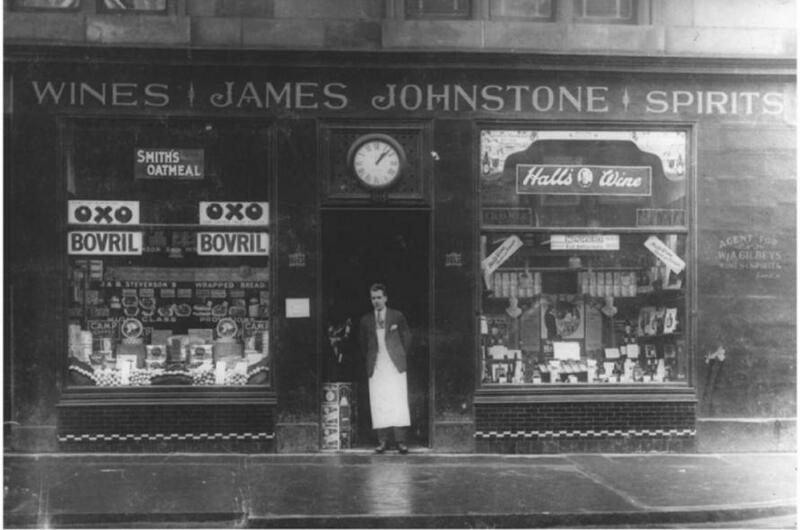 If anyone can help work out who this James Johnstone was, or perhaps even remembers the shop, I would love to hear from them. 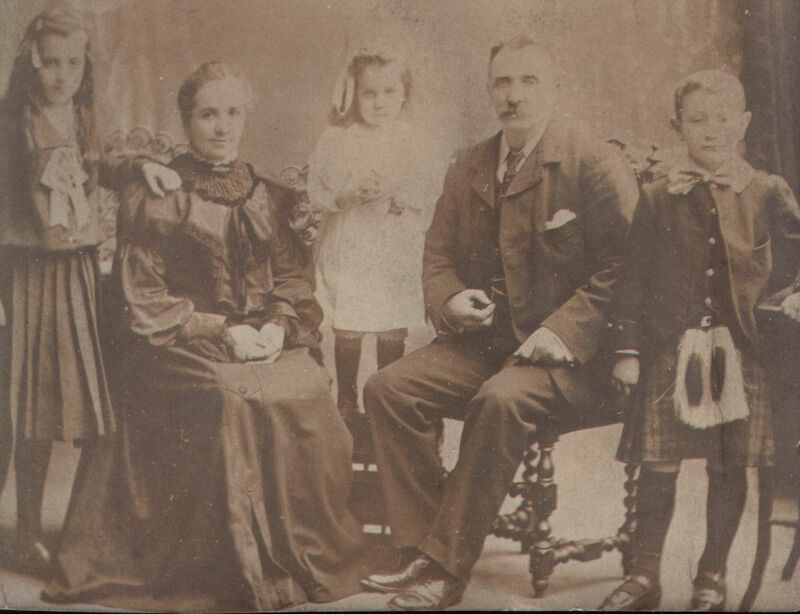 I assume this fifth photo comes from the Scottish side of the family, since the small boy is wearing a kilt. If anyone can help date the style of their clothing, it would be a big help. 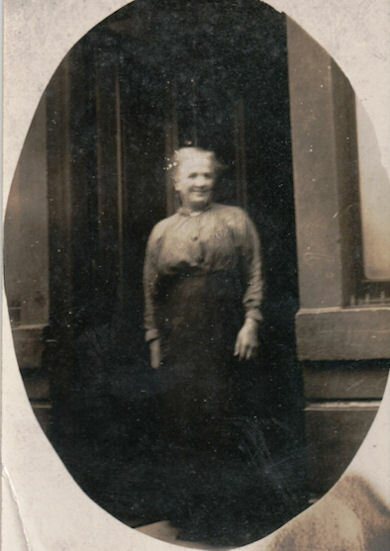 Both of these photo were taken by R. Whiteford, 9 Victoria Street, Rothesay. Were they sisters? This photo comes from a cousin of mine. It was clearly taken in New Zealand by a photographer called Hermann of Cuba Street, Wellington. On the back it has written "For Grandma. With Love from Emma.". Does anyone recognise this smart young couple? Even some help dating the photo would be really useful. 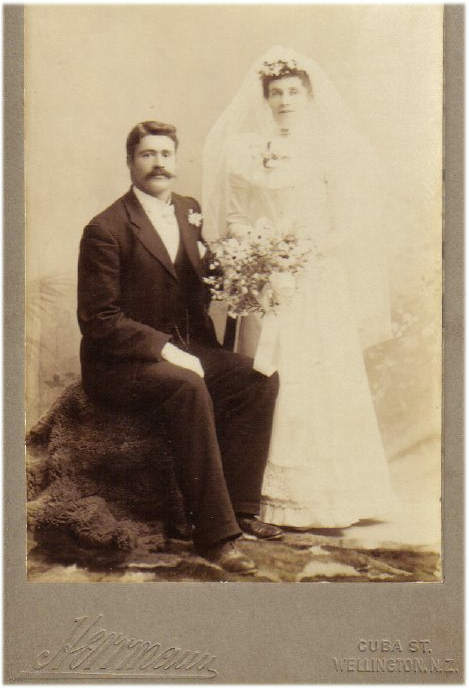 Presumably the couple married in New Zealand, but Grandma was still back home in the UK, as this is where the photo ended up. Any help would be much appreciated.